Low-Profile Conveyors have open-side stand design. Conveyors have one-piece steel frame which allows cantilever-style construction with single side support to enable belt change without removing conveyor or stand mounts. Open-side stand design enables belt change in 2 min or less on small- to medium-size conveyors, and supports full conveyor capacity on widths of 7½ in. or less. Swing away supports are offered for larger conveyors and loads. October 2003 — Conveyor Technologies Ltd. enhances the fast changeover, high up-time capabilities of its family of low-profile conveyors with a unique "open-side" stand design enabling endless belt change in two minutes or less on small to medium-size conveyors. On large conveyors, the quick-change design allows 95% or better time savings. The innovative design can save 45 minutes to two hours in downtime over belt change with a conventional stand mounting, along with avoiding thousands of dollars in lost production on an unplanned change. The quick-change configuration, utilizing the high strength and exceptional rigidity of Conveyor Technologies' steel conveyor frame and mount, allows cantilever-style mounting to just one side of the stand. This permits legs on the stand's opposite side to stop short of the conveyor frame, eliminating obstructions to slide-off/slide-on belt removal and installation. The conveyor does not have to be dis-assembled from the stand for belt change, as with conventional units. The tail pulley mounting permits rapid de-tensioning to free the belt for removal. 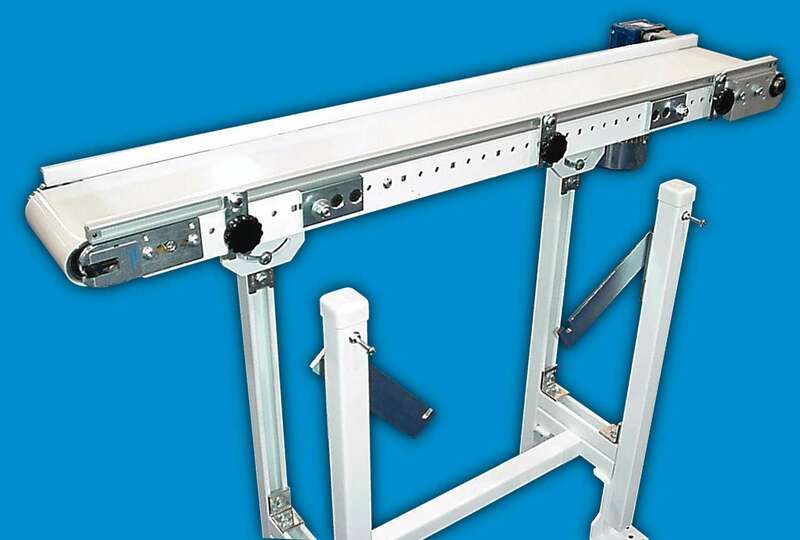 Side rails with brackets remove in seconds with Conveyor Technologies' optional quick-set knobs. The cantilever mounting is designed to support full conveyor capacity on widths of 7-1/2” or less. For larger conveyors and loads, the company offers supplemental swing-away supports for the short side connecting frame to leg. Simply loosening two bolts allows the support to swing down, giving open access to the belt. Engineered for flexible, high-uptime production, Conveyor Technologies' low-profile conveyors are ideal for automation of work cells, packaging machines, automation, assembly, and similar operations. A broad selection of modular low-profile conveyor designs enables close application-tailoring at standard unit economies. Line choices include end-drive, center-drive, cleated, magnetic, vacuum, high temperature, high speed, self tracking, and AccuMove precision indexing conveyors.